Ever since smartphone manufacturing company has increased in world market, there has been considerable drop in smartphone price with high configuration. Beside there has been revolutionary changes in market after MI has entered in to Indian market. Before that in price sensitive market like Indian users tend to get smartphone that have good config but at much higher price. There are many company provide good config at reasonable price viz. Lenovo , Yu, Vivo, Honor and so on. 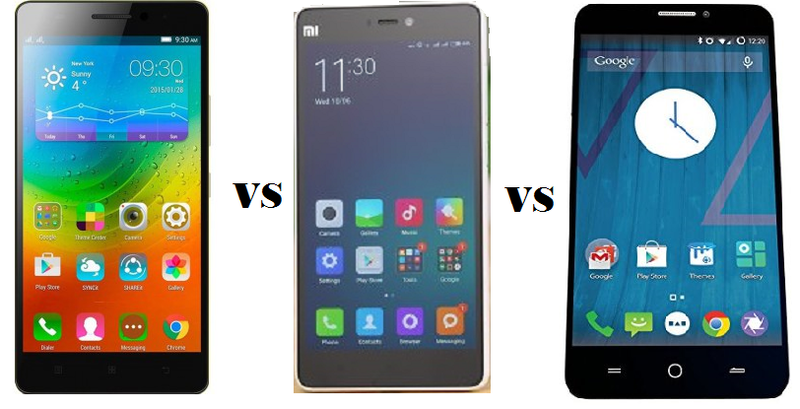 So today I am going to compare this three smartphone that are are have almost the same specs. 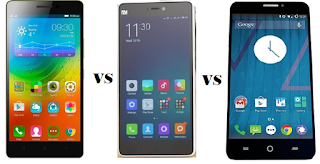 Mi 4i VS Lenovo K3 Note VS YU Yureka Plus. Display is most important aspect that user select while selecting their smartphone. Mi 4i have comparatively small screen then Lenovo Note K3 and Yu Yureka Plus. Mi 4i have advantage over Yureka Plus and Lenovo Note K3 since it is easy to handle by one hand. If you prefer to have large diaply with full HD display then you can opt for Yurka Plus or Lenovo Note K3. Beside this Mi 4i also provide scrach resistance display that protect the device from getting scratch on the scree. Where on the other hand you will get Corning Gorilla Glass 3 in Yureka Plus. But Yureka Plus and Mi 4i have impressive display. Where Note K3 is little disappointing, because it do not have that crisp display so. Mi 4i: (1.7 +1.0 GHz) GHz Quad-Core Qualcomm MSM8939 Snapdragon 615 processor with GPU Adreno 405. Lenovo Note K3: 1.7 GHz Octa-Core Mediatek MT6752 processor with GPU Mali-T760MP2. Yureka Plus: (1.7 +1.0 GHz) GHz Quad-Core Qualcomm MSM8939 Snapdragon 615 processor with GPU Adreno 405. Mi-4i and Yureka Plus have almost same processing power with Qualcomm chipset and same graphical chipset. On the other hand Lenovo Note K3 have Mediatek processor. Here Note K3 is having Mediatek processor that makes it difficult for you to get latest android update. Where on the other hand Qualcomm chipset devices get latest update of Android OS. But on the processing power is more in Lenovo Note 3 that let's you work flawlessly. Mi 4i: 2GB RAM and 16/32 GB internal memory with No external card slot. Lenovo Note K3: 2GB RAM and 16/32 GB internal memory with microSD, up to 32 GB. Yureka Plus: 2GB RAM and 16/32 GB internal memory with microSD, up to 32 GB. All three devices have same 2GB RAM memory where all three devices have 16 GB and 32 GB variant. So you have much memory choice on your disposal. Mi 4i seems have disadvantage since it have only internal memory, there is no option for external card slot. Where as both Lenovo K3 and Yurka Plus have microSD card option exapndable, up to 32 GB. All 3 models have rear camera as 13 MP camera and 5 MP front camera. Mi 4i is best in class for the camera. Xiaomi Mi 4i rear camera using either a Samsung or Sony sensor, and it's got a fast, f/2.0 5-element lens and dual-LED flash with one cold color diode and another warm color that provide more natural tonality to images in scant lighting. Up front, the selfie camera is a 5-megapixel unit with f/1.8 lens. Where Yureka plus is have Sony sensor, and it's got a fast, f/2.0 5-element lens with LED flash that make difficult to capture images in dark place. Where Mi 4i have dual LED flash with cold and worm tone that make it more effective for producing good color reproduction. Where talking about front camera have almost same effect as Mi 4i in Yureka Plus. Beside in Lenovo Note K3 also have 13 MP but compared with Mi 4i and Yureka Plus it is much more disappointed and even front 5 MP shooter is not up to the mark. So if you have selfie crazy and photoholic then I will not recommend Lenovo K3 at all. All 3 smartphone have dual SIM supported by 4G LET that provide access to the faseter access of Internet on this devices. Beside this they also support 3G, 2G, Wi-Fi, Bluetooth. But USB On the go feature is only supported by Mi 4i and Lenovo K3. So Yureka Plus is at disadvantage at this stage. Even though Mi 4i do not provide external memory card option but we can use OTG for more storage space. Mi 4i are Non-removable Li-Ion 3120 mAh battery on the other and Lenovo Note K3 Li-Ion 3000 mAh battery. While Yureka Plus is disappointed since provide Li-Ion 2500 mAh battery. As per our opinion Mi 4i is first best suited candidate for budget smartphone provide awesome battery life with lot of customization, but it lacks behind in memory section. But you cna overcome that by OTG feature. Second candidate is Yureka Plus provide you best camera and other feature with Cyanogen. Where Lenovo Note K3 is not that well suited since do not have fast charging , battery drain is high and so on. Tell us your reviews about the same in comment section below. If you have any other query do let us know for sure we will get back to you soon. UC Browser Surf it All! Surf it Fast!